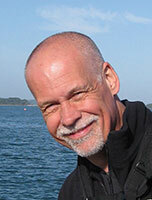 Phil Jones is a British photographer with a passion for wildlife and landscapes. His book, Llwybr Arfordir Ceredigion Coastal Path (published by Gomer Press, ISBN 978-1-848-51213-9, price £19.99) is a selection of photographs depicting the outstanding beauty of the area. Phil has also submitted a further book project relating to wildlife in west Wales. This photograph, which I took early last year at Aberystwyth Pier in Ceredigion, won the Urban Wildlife category of the 2012 British Wildlife Photography Awards. The starlings roost under the pier every year, usually arriving in late October/early November and leaving in spring, and I have photographed them many times. The classic starling shot is of a cloud of birds wheeling over the land in various organic shapes, and I have certainly got a few shots like that, but I try to look for different compositions to show the birds in a new way. I have photographed them backlit by the setting sun, with a wideangle lens, with a fisheye lens and from the pier itself. This shot was planned inasmuch as I knew the birds would start to roost and other birds would fly past. I wanted to get the juxtaposition of the birds’ movement and the industrial lines of the pier. 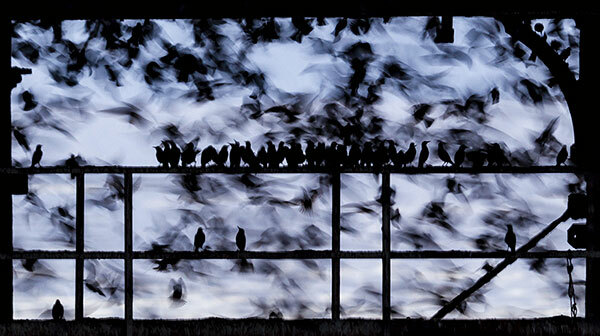 I used a slow shutter speed to add blur to the moving birds while keeping the perching starlings relatively sharp. The day I took this photograph was not good in terms of the sunset, but the lack of strong backlighting made it great for this shot. The starlings are so quick and varied in their movements that there is much to experience with them. The stunning swirling patterns they make, the noise (wings and chirps) and the smell can be overwhelming. In these situations, you must have a plan. A few years ago the plan was to photograph the backlit birds making fiery shapes under the pier, but last year I went for a movement effect with the starlings swirling and a few static birds perched on the pier infrastructure. I used a Sigma 300-800mm lens on my Canon EOS 7D with a Manfrotto tripod and Hähnel wireless remote release so I could keep my hands warm in my pockets! As I was using a slow shutter speed, I had the luxury of using ISO 100. The speed was 1/13sec with an aperture of f/7.1 and a focal length of 500mm. I use Lightroom for all post-processing work and find that I rarely use Photoshop these days. I shoot in raw and all images have basic adjustments for contrast, saturation, vibrancy, sharpening and noise reduction. This image was also cropped so that the black struts of the pier form a natural frame to the photograph. I always try to keep the end result true to the scene as I recall it. This image helped me win an award and I think competitions are a great place to help improve your photographic skills. I have a complete set of Wildlife Photographer of the Year portfolios, Take a View and British Wildlife Photography awards. Seeing how other people have captured a scene often suggests alternatives and makes me aware of where I can go to see wildlife or landscapes when out and about. I think you can learn something from almost any photograph. Even if you don’t like a picture, you can study it to understand why you don’t think it works and what would make it work in your eyes. Don’t copy the views on offer, though. I think there are too many copycat shots of landscapes. By all means go to the place, but look around and find your own viewpoint of the scene. Ultimately, you have to take photographs that you like – and if others appreciate them, that is a bonus! I bought my first 35mm camera, a tank-like Zenit, when I was 18 years old, and started developing and printing black & white photographs in the sixth form college darkroom. In doing this, I think I got a sound grounding in how a camera works, how to make a good exposure and the knowledge of what you can get away with through rescue work in the darkroom. I moved through different 35mm set-ups, but really returned to photography with the advent of good-quality digital cameras as they allowed me to take control of the whole process again, from taking the photograph to printing the final result as I wanted it. I live in a very beautiful part of Britain, with great landscapes and accessible wildlife, and am inspired by the world around me. I am also incredibly lucky to have a hugely supportive wife, Sarah, who is willing to stand in the freezing cold on Aberystwyth promenade in winter for a bag of chips!